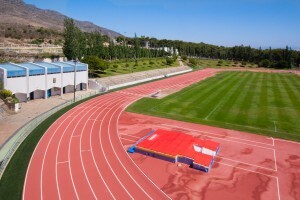 The Stadium “Ciudad de Torremolinos” 8 lane Mondo Sportrack athletics track, forms part of the Sport Village of Torremolinos and is located on the edge of the town. 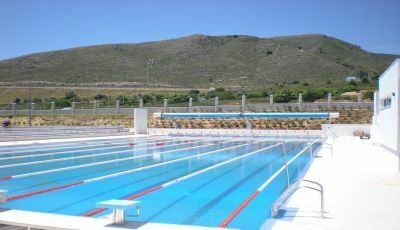 This complex was built in 1997 and has since been refurbished within the last year. 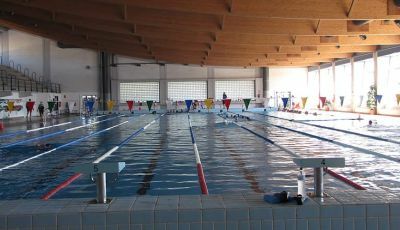 Facilities also include a sports hall and an adjacent gymnasium with weight training equipment: free weights and machines. The infield is used for football so no hammer throwing is permitted but discus, javelin are are allowed in the afternoon. 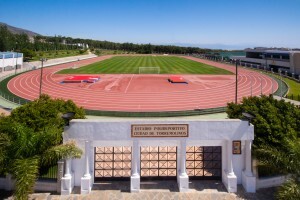 There are 2 long jump/triple jump runways and 2 pole vault runways. 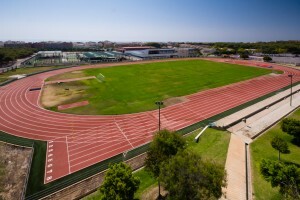 The throwing areas include Discus, Javelin and Shot but only at specific times. 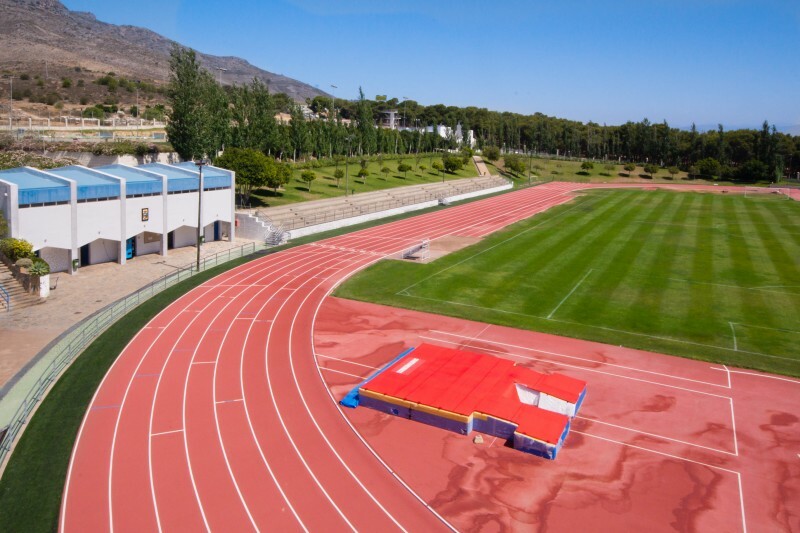 All these facilities are controlled by the Municipal Council of Torremolinos in the Costa del Sol region of Spain, just 15 minutes from Malaga airport. There are many hotels near by but some of which we recommended would include the 3* Griego Mar Hotel and the the 4* Cervantes Hotel (part of the Blue Sea Hotels & Resorts). 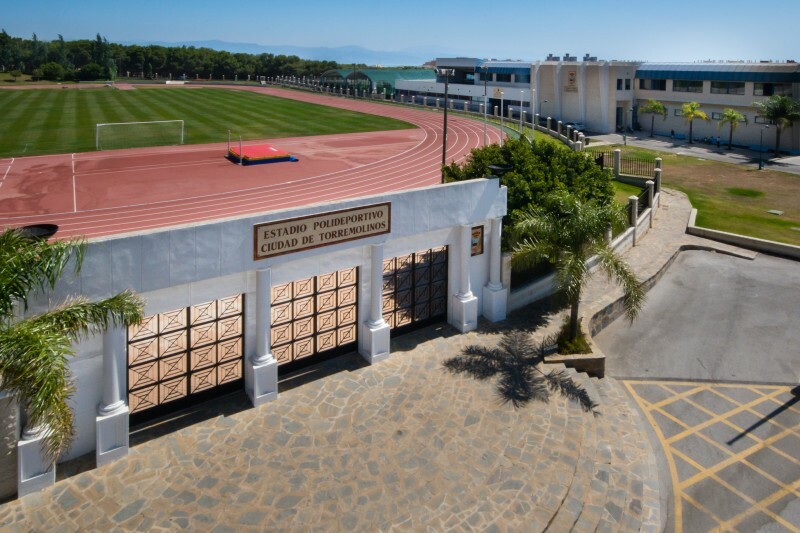 The hotel Griego Mar is ideally situated for access to the town centre, and both the beach, track and swimming pool that are both a 15 minutes walk away. The newly refurbished rooms are spacious and all have balconies. Each room has private bathroom / WC and TV. The restaurant has a varied menu and is buffet plan. There is a leisure swimming pool, two bars and a discotheque. All accommodation prices are confirmed at the time of booking based upon a group’s chosen departure date, choice of accommodation, meal basis & numbers in the group. Excellent price for All Inclusive! The Hotel Cervantes is centrally located in Torremolinos, 5 minutes’ walk from the Beach. It offers a rooftop pool and a spa with a sauna, indoor pool and gym. Bright, air-conditioned rooms are soundproofed and feature satellite TV, private balcony and some with sea views. There is a safe, and the private bathroom comes with a hairdryer and amenities. A buffet breakfast is offered and room service is available. Free WiFi is available at reception. Closer to the beach but about 15-20 minutes’ walk from the training complex. Flights can be booked independently or through ourselves and are quoted separately from the training package arrangements. We can offer flight options from any operating UK major or regional airport to Malaga airport and we can coordinate return airport transfers for any number of athletes, if required. Direct flight operators include low cost airlines such as Easyjet and Ryanair, and scheduled flights with British Airways, Monarch and Iberia, often operating numerous flights a day. Fares from: £120 per person including luggage.